Satliva Mango Lavender Face Cream is a unique blend of Indian hemp seed oil, mango butter and moringa oil. The combination is loaded with antioxidants, minerals and vitamins, that are required for a healthy and naturally glowing skin. The carrot seed oil has antioxidants and is abundant with vitamin-A that protects and treats sun damaged skin. This remarkable face cream has amazing anti-ageing properties. Thanks to the rich antioxidants in Indian hemp seed oil and moringa oil, the cream helps in deep cleansing by clearing clogged pores and dead skin cells, while protecting the skin from harsh pollutants and sun damage. Satliva Mango Lavender Face Cream is a nutrient dense cream that tightens the skin muscles, clears and diminishes age-old scars and marks, doubles as under-eye cream diminishing dark circles, making your skin naturally radiant and gives a clear uni-tone to the skin texture. Need more reasons to love this? 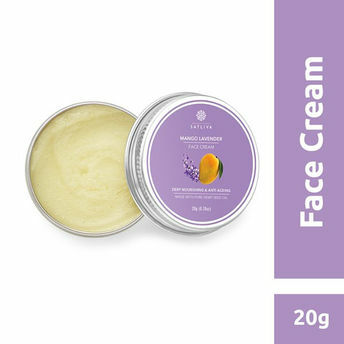 Alternatively, you can also find many more products from the Satliva Mango Lavender Face Cream range.